LOS ANGELES — The Giants altered their rotation so trade deadline acquisition Matt Moore could make a difference in this big series. A Dodgers pickup beat Moore to the punch by a day. In his first start for the Dodgers, left-hander Rich Hill pitched six shutout innings. 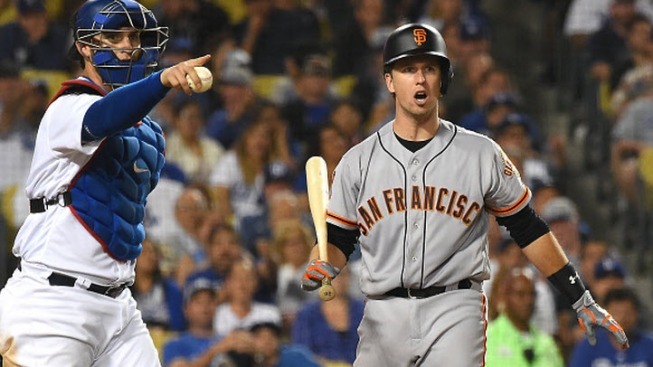 The Giants didn’t have any more luck against the bullpen, falling 1-0 at Dodger Stadium to drop three games out of first place in the National League West. They are now just half a game ahead of the Cardinals atop the Wild Card standings. Hill was making his first start in 48 days and first since being traded from the A’s to Dodgers. The blister that sidelined him for so long didn’t appear to bother him on the mound, as he scattered five singles in six innings. Johnny Cueto was just as good, and he didn’t allow a hit until the fourth. That first one was costly, though, as Justin Turner blasted a hanging slider just over the wall in left. A disgusted Cueto took a big wad of gum out of his mouth and fired it about 50 feet. That was the entirety of the damage against the starting pitchers. The Giants got a one-out walk in the seventh but couldn’t capitalize. Angel Pagan drew a walk with one out in the eighth but Buster Posey struck out. Hunter Pence singled to right, bringing Dave Roberts out for a meeting with right-hander Joe Blanton. With a lefty warming up, Roberts stuck with his guy. Crawford fouled Blanton’s first two pitches off and then blasted a curveball deep to right. For a moment it looked like the shortstop had hit a three-run homer, but Josh Reddick snagged it with his back up against the wall. Starting pitching report: Cueto was charged with one run on four hits in six innings. He struck out six and walked just one. After a bit of a rough stretch, he has two straight strong starts. Bullpen report: Will Smith has faced seven batters in this series and retired six of them. That’s a big step up from where he was. At the plate: Pagan’s hitting streak ended at 19 games. In the field: Crawford made a spectacular play to lead off the game, snagging a short-hop and popping up with a strong throw that got Chase Utley by a step. Soon, he will have a Gold Glove for each of his daughters. Attendance: The Dodgers announced a crowd of 43,957 human beings. No beach balls made it to the field tonight. Up next: Moore makes his biggest start for the Giants (obviously). He’ll face Ross Stripling, who nearly no-hit the Giants in April.